Satelite.io | Play Satelite.io free on iogames.space! Take out the current leader or go for the high score yourself! You are your own weapon and everyone else's worst nightmare! 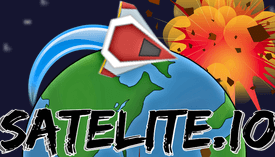 Satelite.io is a 2D one-button physics based simulation filled with explosions where you can orbit the earth and destroy other players. Start out on the Earth and then use your boosters to launch into space and establish an orbit. Earn a high score or kill as many leaders as possible so that you can earn the crown. Don't stop there though, you'll be the next target, so you better keep a close eye as everyone has you on their radar and they prepare their own attacks! Do what it takes to get that crown, just don't crash into the Earth and escape the other players as they try to ram into you. Keep the number one spot for as long as possible and rub it in everyone's faces the entire time! Satelite.io can be played from anywhere with a mobile device, tablet, or PC. Enter a username on the front page and your spaceship will be ready to launch. Register your account for ease of access and upcoming additional features. -Orbit closer to the Earth to gain more points! Orbit the Earth closely to gain a high score but don't let any other players crash into your or you'll need to start over. Work up the rankings and become the leader. Keep up those maneuvers to dodge the other players once you are in the lead and hold onto that crown! Don't feel like going after the high score? Aim for the leader instead and ruin someone else's attempt at breaking the record. Strategically adjust your orbit or just go for one massive series of boosts to knock them out with an exciting explosion! Register an account using your choice of third party service to keep track of your high score and how many leaders you have taken down. Claim the crown and prove it! Try to beat your own score and everyone else's! v0.11: March 13, 2019 - New skins for St. Patricks day!